This year my creation is called Reindeer Fligbt School. I dreamt it up after watching the tv show Rudolf. I ended up winning first place and viewer's choice at the Darnall's House Mueseum's Annual Gingerbread Contest and Show. Each stall in the big building has a reindeer, food and water. The guard dog is a replica of my own chow chow,Teddy. A replica of my cat, Midnight is in the loft. Santa is on tbe flight observation deck. You will notice that some deer have harnesses. These are the students. Rudolf is one of the students, who is being kissed by his sweetheart, Clarise! I can see why you won. You are quite a professional at this! The detail is amazing from what I can see!! Loved the reindeer and sleighs. Thanks for sharing! Join in and write your own page! It's easy to do. How? 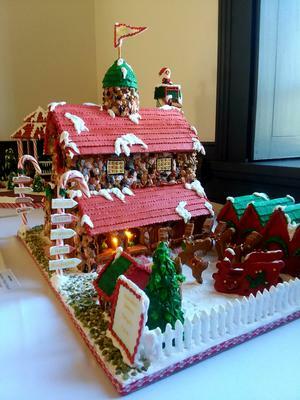 Simply click here to return to Gingerbread Contest Photos.